It's set in the late 2000s, but starting at a 50s-styled retro-diner with waitresses in pink poodle skirts and roller blades and dreams of getting married off to the local handsome guy with a nice smile and sunglasses. Personally, I liked that supposedly modern setting but with everybody and all their ideals still living in the past. Malinda Williams. Photos Courtesy of Nailed. Alice (Jessica Biel) is the waitress in a pink poodle skirt and ponytail in love with local lawman Scott (James Marsden) who all the girls want, but tonight's the night that Scott should be proposing to Alice. But the restaurant is under-going renovations while serving patrons and an accident with a nail gun leads to a nail getting lodged in Alice's skull, and brain. Let the comedy begin. Marsden as the “perfect” Scott was hilarious – first being unromantic at their proposal date, then negotiating with the doctors about Alice's options, then ultimately breaking up with her when she can't get the nail removed (due to her lack of health insurance) and she'll just be too annoying to be with. The side effects of having a nail in one's head are erratic behaviour and increased sexual arosual. So Alice is left with nothing but a nail in her head. Then she sees a commercial for a local congressman promising to help people and their problems. Alice is now off to Washington, DC. More comedy arising from the retro setting since her family is shocked at her decision to travel all the way to Washington, as if it's a foreign country. This is clearly the type of town where nobody leaves. In Washington, the idealistic Alice meets Congressman Howard (Jake Gyllenhaal). She's attracted to him, he's attracted to her, he's completely corrupt with no intention of helping her, but she still believes him. The film gets caught up in a completely convoluted plan where corrupt politicians have this moronic bill called a “Moon base” and convince innocent girl scouts and naive Alice that this will actually help them. It's a whole lot of back and forth, all of which is nonsense, some of which is still funny. But as Alice starts figuring out what Howard is up to, the film eventually finds its way back around. The original characters including Alice's friends and family members and ex-boyfriend Scott make their way to Washington to help her. They start entering the 21st century, but of course the political muddle that is Washington is timeless. The third act is funny and clever in all of its twists satirizing the political view of healthcare in the United States government. The fact that it's co-written by Al Gore's daughter really makes me like that part. 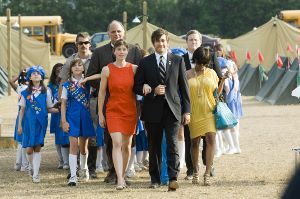 Accidental Love is a romantic comedy even if the romance part is very short on relatability and idealism or even romance, but it is funny. It's silly and wacky, but also pointed in its own weird way. I have to believe it would have played a lot better if it was released when it was first made before ObamaCare, but even then it's an out-of-this-world, un-romantic, romantic comedy whose jokes are aimed at the real world. But it's a trip that I still enjoyed. They Came Together (2014) - Skewers romantic comedies without insulting its fans leading to a very funny comedy. The Longest Week (2014) - A romantic comedy that falls short of its aspirations. Walter (2015) - Tips too heavily to the drama side of quirky comedy. Playing It Cool (2014) - Forgets the structure of a rom-com and loses the romance and comedy.